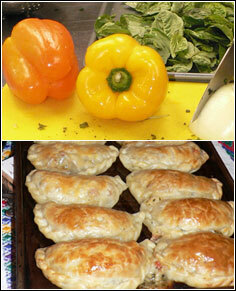 News & Updates | PAMPEANA EMPANADAS - Seattle and Tacoma's Home of the Baked Empanada! Just when you thought our empanadas couldn't get any more delicious...we go and put mac & cheese inside them! Try our new Mac & Cheese empanadas, with the filling provided by our fellow local vendor Girls Gone BBQ and the flaky pastry shell from Pampeana. We'd say that they're perfect for kids but let's be honest, no one grows out of mac & cheese. Try one at one of our local farmers markets, or place an order for a frozen dozen to have on hand for family dinners. We were invited to do a live cooking segment on King 5's New Day Northwest last month. Nancy showed the host Margaret and the audience how to make the different empanada folds for our spinach and carne empanadas, using our dough shells and fillings. Watch the video segment and feel free to contact us about more cooking opportunities, that was fun! Our delicious, locally-made South American caramel is now available for purchase to take home and use as you wish! Drizzle it over vanilla ice cream. Spread it on pancakes. Bake it into a cake for a rich dessert. Or, do like we do on occasion and eat by the spoonful... we won't tell anyone! 8 oz. containers are available for $3.99 at our farmers market locations or by order. Wondering what to get someone for the holidays? Empanadas make the perfect, unique gift! 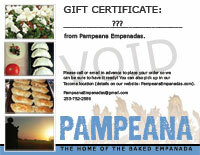 We can provide gift certificates in any amount, redeemable either for entree or appetizer sized empanadas in the flavor of the recipient's choice. Give us a call or email us for more details! "Thanks again for the last minute order. The empanadas were a huge success. There were 3 people from Buenos Aires with us last night and they were VERY complimentary about the quality and authenticity of the empanadas." Read some Pampeana Empanada reviews on Yelp! Our baked empanadas have ZERO grams of trans fat and on average 45% less fat than the fried variety!